Yesterday we talked about a card that needed a Pokemon to get KO’d to retrieve cards from your discard pile. Today we talk about a Pokemon that needs to get KO’d to retrieve cards from your discard pile. Can’t help but feel we’ve been here before. Electrode-ex is a Stage 1 Lightning Pokemon, 90 HP, with a Fighting Weakness, no Resistance, and a Retreat Cost of 1. His Poke-Power is Extra Energy Bomb, which lets him KO himself to get 5 Energy cards from your discard pile and attach them however you’d like to any of your non-ex Pokemon. You can tell it’s a Poke-Power, since it can’t be used if Electrode-ex is affected by a Special Condition. Crush and Burn is a 2-for-30 attack that lets you discard any Energy off of any of your Pokemon in play and deal an additional 20 damage for each card discarded this way. I imagine that Electrode-ex seemed pretty busted, since you could effectively take Energy from anywhere and use it to power up his Crush and Burn attack. However, this was in the FRLG era of cards, where things were comparatively slower. That’s why Crush and Burn has a low damage output by today’s standards. If anything, I’d imagine Electrode-ex in those days was used for his Poke-Power, which could power up something tremendous. The only issue would’ve been the KO, which gives your opponent a Prize. In fact, since it’s Electrode-ex, it would give your opponent 2 Prizes. So was it worth it to give your opponent 2 Prizes just to power up your guys? Actually, yeah! There’s an old deck called “BombTar” that specifically revolved around this combination. All you needed other than Electrode-ex was the right partner, which turned out to be Dark Tyranitar (19) from Team Rocket Returns! Utilizing Electrode-ex’s power to fuel Dark Tyranitar, the latter could rage on with a combination of Spinning Tail for massive damage on everything, Grind for a cheap move, and even Bite Off to tear through other Pokemon-ex. The end result would land Ross Cawthon in 2nd place in the 2005 World Championship, beaten out only by the Queendom deck of Jeremy Maron. So perhaps when you look at a card like Diantha and wonder, “Is it worth losing a Pokemon to get some advantage?”, just keep the Bombtar deck – and Electrode-ex – in mind. You never know what’s worth losing until you’ve ridden it to Worlds. Arora Notealus: Electrode-ex provides a lot of thought into the idea of giving up something to gain so much more. I can’t help but think of cards from Magic (primarily black mana cards) and Yugioh that would incorporate some sort of cost for some payoff. Something as simple as paying life or discarding a card suddenly warrants overwhelming advantage. I imagine Electrode-ex to be a Pokemon equivalent of sorts, in that you give your opponent a lead with the two Prizes, only to dominate them with a fully powered-up Pokemon in turn. Next Time: Coming back to Alola, we talking fire! Fire dancers that is! Today’s Throwback Thursdays is pretty unusual because we are actually reviewing a very old card which will soon be modernized and released in the next few months. In today’s case, that would be Electrode-ex from EX FireRed and LeafGreen. It is a Stage 1 Lightning type with 90 HP, weak to Fighting, and a retreat cost of one. It’s Poke-Power, Extra Energy Bomb, you can Knock Out this Pokémon and your opponent gets 2 prize cards, but then you search your discard pile for 5 Energy cards (meaning both Basic and Special Energy counts) and attach them to any of your Pokémon in any way you like (excluding Pokémon-ex). Magnificent energy acceleration and recovery is well worth the two prizes, if you actually had a good single-prize Pokémon that can take advantage of this energy acceleration in that same turn to dish out serious damage. Crush and Burn costs LC for 30 damage, and you may discard as many energy cards as you like from your Pokémon, and it does 10 damage for each energy card you’ve discarded. This attack could be a good lead to it’s Poke Power. The plan would be to use Crush and Burn for great damage while discarding several energy cards from your Pokémon, and then on the next turn, you KO this Pokémon and get your energies back on any of your Pokémon. And if Electrode-ex was on the Active and was KOed intentionally, you can promote another Pokémon in the front. Now, we get to the modernized version of Electorde-ex: Electrode-GX from SM Celestial Storm! This one is a Stage 1 Lightning type with 190 HP (the new low of a Stage 1 GX), weak to Fighting, resists Metal, and a retreat cost of one. This ability does the same thing, but now excluding EX and GX Pokémon. Crush and Burn is gilded with the GX treatment, but the damage scaling is superb. LC for 30 damage plus 50 more damage for each energy that you discard from your Pokémon; takes 4 energy cards and a Choice Band to OHKO anything. Energy Ball is terribly filler; LC for 50 damage. That HP is actually enough to survive unlike the old-ex version. I don’t feel like I would score this card because I can wait for the modernized card to be released couple months later. However, there was a review of Electrode-ex here (https://www.pojo.com/COTD/2004/October2004/08.htm). Some reviews were mixed, so that should give you an idea how Electrode-GX would fare in the current format. Fighting weakness is still dangerous now; before there was Haymaker Hitmonchan that hits hard for one energy, now Buzzwole-GX is the power creeped version of that. Electrode ex (RG 107) will return to the meta as Electrode GX in the upcoming Champion Road expansion set. Electrode has a very impactful ability: Extra Energy Bomb allows you to attach five energy cards – Basic AND SPE there is no written prohibition against attaching SPE. There is a written prohibition against attaching to any EX or GX Pokemon… and the cost for using this ability is that Electrode must knock itself out, meaning your opponent gets to draw a prize card. I pretty much stopped right there when I read this for Electrode GX. As soon as my eyes hit the words, “this counts as Knocking Out this Pokemon”) I pretty much scrolled on to Chinchou and Lanturn. I had to go back and re-read the card again for this review because I’m sure I instantly moved on when I read “Knocking Out.” Electrode ex KO’s itself and it costs a prize card. Electrode GX KO’s itself, and it costs TWO prize cards. And you can’t attach any of those five prize cards to GX Pokemon. If I force myself past the fact that I just turned the match from a six to a four prize card game, if I’m being objective and honest with myself, I suppose that being able to attach five energy cards to any single prize Pokemon is a huge advantage. Moreover, with Stage 2 Pokemon, you can never get out more than three or four anyways, so you could build a deck exclusively around a Stage 2 Pokemon. A lot of times you’ll have a setup Pokemon (like Alolan Vulpix) or try to squeeze in a Big Basic (like Baby Buzzwole or even Buzzwole GX), but this way you can focus on getting out at least three if not four feature Stage 2 Pokemon, and this will definitely be a good way to accelerate energy onto them. But man it’s tough getting past giving up two prize cards to do this. I’m sure I’ll try it and I’ll test it, but giving your opponent a two prize card lead is a huge leap. So after thinking about this a little bit more, I’m actually leaning a little more towards this being somewhat plausible. It is an ability – not the effect of an attack – so if you power up your active Pokemon with this, you can still attack and potentially make it a five to four or even four to four match right away. But this is really going to need some testing, and you’re going to have to have single prize Pokemon that can really do some damage. It is time to travel back to the past, but also to look forward to the future. Why? Today we’re looking at Electrode-ex (EX – Fire Red & Leaf Green 107/112), which is getting an update as “Electrode-GX” (already out in Japan). This will not be a review of the new card, but we’ll look at how the original faired to get ideas about the new and discuss it after reviewing Electrode-ex. Electrode-ex officially released August 30, 2004, and remained Standard-legal until the rotation that went into effect on September 1, 2006. During this time, there were different T1 rules; that player did not draw at the beginning of the turn and could not play a Supporter from hand but was allowed to do anything else normally permissible, including attacking. Again, this was only applicable for the first turn of the player going first; after that Player 1 could draw and use Supporters, and Player 2 didn’t have to worry about any special restrictions. Neither player could manually Evolve on their respective first turns, but could use effects that permitted Evolution; of particular note would be Rare Candy as prior to the BW-era, it worked differently. Instead of letting a Basic Pokémon, which was already legal to manually Evolve into its Stage 1 form, to skip directly to its Stage 2 form, it allowed a Basic to immediately Evolve into either its Stage 1 or Stage 2 form, even on the first turn of the game! Electrode-ex is a Pokémon-ex, and while that is similar to a Pokémon-EX or Pokémon-GX, it is distinct both in terms of card names and effects which apply to them. e.g. a deck in the Unlimited Format could contain four Mewtwo-ex and four Mewtwo-EX while Pokémon-ex could use Counter Energy and Pokémon-EX/GX can use Scramble Energy (if Evolved). Pokémon-ex give up an extra Prize when KO’d, are targeted by certain detrimental effects, and excluded from certain beneficial ones, but enjoy better HP scores and (sometimes) better effects than their baseline counterparts. This included HP scores that would exceed the typical maximum, but nowhere near the boost Pokémon-ex and Pokémon-GX received; when 120 was the maximum for a baseline Pokémon (and almost never seen on a Basic), it was the still maximum for Basic Pokémon-ex, while a Stage 2 Pokémon-ex could have 160 HP and Wailord-ex had 200 HP. Pokémon of all stripes weren’t restricted to two attacks or a non-attack-effect and an attack. Pokémon-ex just were just much more likely to have a non-attack-effect and two attacks, or three attacks, or even up to four attacks. There was even one that had no attacks but both a Poké-Body and a Poké-Power. What are those? Pre-cursors to Abilities; though they work similarly, but are mechanically distinct from each other and from Abilities. Being a Stage 1 was perfectly fine at this point in the game; being a Basic actually was not the best, as non-Evolving Basics were intentionally nerfed pretty hard. Some were allowed to be great openers. Some might be a useful Bench-sitter. Some were allowed to be counters to something that was really strong e.g. Pokémon-ex. Only a few were worth it as a deck’s main attacker and of those, even fewer were working without an Evolution backing them up. Again, also remember that Rare Candy would allow you Evolve into your Basic into a Stage 1 immediately; I don’t think it was good for long-term game balance and development, but it was wonderful for Stage 1 Pokémon in the short-term. Even if you didn’t run Rare Candy just for that, it was likely you had a Stage 2 that necessitated Rare Candy in your deck but which could spare a copy to help out a Stage 1 you were also running, and some Stage 1 decks did demand maxing out Rare Candy even without a Stage 2. Electrode-ex has 90 HP; abysmal for a 2-Prize Pokémon now (especially a Stage 1), merely “poor” back then due to both lower average HP scores and average damage output per turn. As we’ll soon see, it didn’t actually matter much anyway, so this is probably clever card design. As with now, the severity of a particular Weakness varied according to the rest of the metagame; I cannot remember if the [F] decks of the time were a big deal or not and – once again – we’re not really worried about that for something we’ll soon address. No Resistance is the worst but – again – it won’t really matter. A Retreat Cost of [C] was good but not great, and yet again, it would rarely matter and yes, I’ll finally explain why; the Poké-Power. “Extra Energy Bomb” says you can discard Electrode-ex and all cards attached to it which counts as it being KO’d (so your opponent takes two Prizes). If you do this, however, then you can attach up to five Energy cards from your discard pile to your in-play Pokémon (excluding Pokémon-ex). That is a total of five Energy cards, not five per Pokémon. Not working on fellow Pokémon-ex hurt but not only was the exact distribution of the Energy up to you, it worked on Special Energy cards! Remember how I mentioned Counter Energy and Scramble Energy earlier? Scramble Energy was the pickier but more potent version of Counter Energy; it couldn’t even be attached to Basic Pokémon or Pokémon-ex but it provided three units of Energy that counted as all Types. Let that sink in: if you had all four Scramble Energy in your discard pile, you could then attach them all to a single target and take it from zero Energy to 12 Energy while also covering all Type requirements! Pretty ridiculous, but even reclaiming and reattaching one Scramble Energy could be game-changing. We also had Double Rainbow Energy at the time, which didn’t care about your Prize count but only worked for non-Pokémon-ex Evolutions and the Pokémon with it attached did 10 damage less with its attacks before Weakness/Resistance, so you had something worth attaching even if you hadn’t fallen too far behind. If you just needed raw Energy quantity, Boost Energy was also an option; again, it only worked with Evolved Pokémon but this time, it was compatible with Pokémon-ex (I’ll explain why that matters in a moment). Boost Energy (for some reason) wouldn’t let you Retreat but it provided [CCC] but discarded itself at the end of the turn in which it was attached. If that sounds bad, remember that Double Colorless Energy was long gone from the Standard Format at the time, and wouldn’t return until several years later. Of course, getting up to five basic Energy cards attached from the discard pile was powerful as well. So… why was it such a big deal to attach these Energy cards? Besides the obvious, I mean. While Double Rainbow Energy and Scramble Energy would still discard themselves (due to their clauses), basic Energy cards and other Special Energy could be attached to a non-Pokémon-ex, which includes something that could Evolve into a Pokémon-ex. Going down two Prizes was rough, but we had Rocket’s Admin. and Pow! Hand Extension. Rocket’s Admin. is almost the exact same card as N but with a different name, and drawing (but not shuffling away your hand) was optional. Pow! Hand Extension is a better version of Counter Catcher. Like Counter Catcher, it only works while you are behind on Prizes, but it lets you pick between two effects; forcing the opposing Benched Pokémon of your choice into the Active Position or moving an Energy from one of your opponent’s Pokémon to another. This led to Electrode-ex being used with some crazy control decks, ones that would sometimes detonate two Electrode-ex on their first turn, and not even attach much Energy with them. The goal was to use Rocket’s Admin. to drop your opponent’s hand down to two cards, then another effect to get rid of those cards. I haven’t mentioned the attack on Electrode-ex, which is “Crash and Burn”. It requires [LC] and allows you to discard as much Energy that are attached to your Pokémon as you want, then does 30 damage plus 20 per Energy you discarded. Pretty weak now, but a solid attack back then… just not something to rely on too much since Electrode-ex was somewhat fragile. Though I mentioned that particular control deck, the one Electrode-ex deck that had great competitive success and which I can easily find is “Pow!Block”, which appears to be the same deck that aroramage mentioned above, the one Ross Cawthon used to take second place at the 2005 World Championship in the Master’s Age Bracket. I found it here, but for the sake of space, I won’t be posting it. It doesn’t use the Evolution workaround to attach to a Pokémon-ex, but it does include Rocket’s Admin, Pow! Hand Extension, and Scramble Energy. Electrode-ex fuels Dark Tyrannitar (EX – Team Rocket 19/109). It also uses many of the tricks common to decks at the time; I mostly wanted to point out the inclusion of Pidgeot (EX – Fire Red & Leaf Green 10/112) and Magcargo (EX – Deoxys 20/107). That means the deck could not only use “Quick Search” to add any one card from your deck to your hand once per turn but could also search the deck and topdeck another card of your choice. It also included Darkness Energy… specifically the Special Energy card version of Darkness Energy, which is not Expanded or Standard legal. These cards came from a time when there were no basic Darkness Energy cards, only certain Special Energies that could provide [D]. The Special Energy version of Darkness Energy not only provided [D] but allowed [D] Type Pokémon and those with “Dark” in their names to do an extra 10 damage (and multiples stacked)! 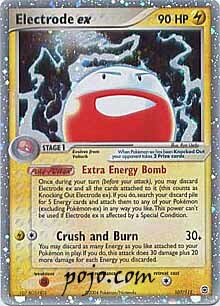 Electrode-ex was a very good card, but it needed a deck built around Extra Energy Bomb. So, what are the prospects like for Electrode-GX? Not as good, but far from bad. The Magcargo I mentioned above is also getting an update, but Rare Candy isn’t going back to how it used to work and the game’s pacing – while it might slow down after rotation – is still faster than back in the day. Less time to Evolve, a better chance your opponent scores a KO before you can Evolve into Electrode-GX and use its Ability, etc. We’ll have to see how things actually play out, but at least Electrode-GX offers the hope of being a great card. *Remember, you start with only four Prizes in the Limited Format and you’re building a deck from whatever you pull. I’d still include Electrode-ex, I just would be using it for its attack more than the Poké-Power.